"If like me, you attended this year’s National Architecture Conference, Parallax, then you may very well still be basking in its glow. I was inspired, challenged and provoked by the presentations that went on in the seminars and equally engaged by the discussions that took place outside of the auditorium. Being introduced to the work of Sou Fujimoto, Tatiana Bilbao and Studio Mumbai was a highlight for me, and I am very happy to feature the latter as this issue’s Architecture Profile. The vigorous thinking of Slavoj Žižek – genius programming on the part of the Creative Directors – will remain in my mind as one of the most memorable seminar presentations I have ever attended. But what does it all mean? 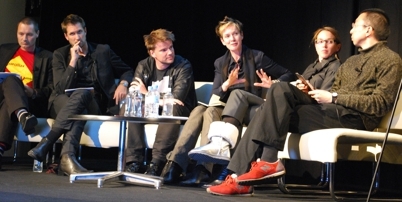 Certainly, I don’t have the room here to give that question the lengthy answer that it deserves, but I do know for certain that the architecture community in Australia – and as it sits in a broader international context – is very much alive. In these current challenging economic times, this very simplistic statement actually means something. I was interested to hear the discussion turn to the collaborative nature of architecture in the final Forum seminar and was struck by the inherent generosity displayed by the Creative Directors and participants that very much reinforced the notion of community."